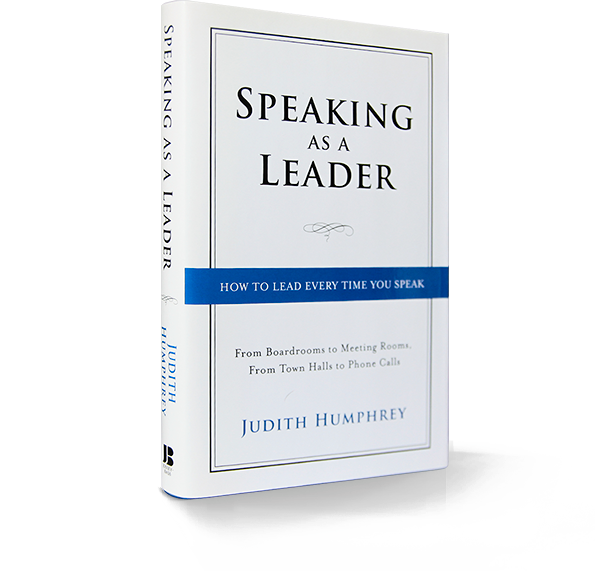 Speaking as a leader is a classic for those who wish to turn every speech, presentation, and informal set of remarks into an act of inspirational leadership. It is chock full of riveting real-life examples drawn from The Humphrey Group’s privileged work with leaders. The book has been a business best-seller since its publication in 2012. “Speaking as a Leader will take you to a new level of leadership—to where you speak not only about what you know, but more importantly about what you believe and want others to believe. We have all heard speakers who leave us with a lasting, positive impression—they are not necessarily charismatic in the traditional sense of the word. . . . But they speak sincerely, deeply, and with passion about what they believe. They speak in a way that engages others, and moves them. They are the leaders of the twenty-first century. Speaking as a Leader will enable you to achieve this power by bringing forward your ideas and expressing them with clarity, confidence, and true charisma. You will learn how to communicate every day with well-focused, clearly developed messages. You will learn how to mobilize others through the power of your ideas. You will learn how to lead every time you speak. –Stephen Dyer, Senior Vice President, Retail, Agrium Inc.
Jay Robb, “Book Review: Speaking as a Leader,” The Hamilton Spectator, April 9, 2012.